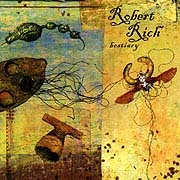 Bestiary by Robert Rich is unlike anything we've ever heard by this prolific explorer in electronic sound. It is a piece in constant transition and quite possibly the ultimate example of "glurp", that sonic representation of squish. Throughout Rich's music is the underlying metaphysical principle of the inseparable relationship of the part from the whole. So what better instrument to realize Bestiary with than the MOTM synthesizer; a modern modular system whose totality is greater than the sum of its modules. This versatile method of music making gives the artist extensive and immediate control over critical aspects of sound design. By tweaking dials, flipping switches and plugging patchcords, Rich's hands are constantly altering the energy within the music. The result of one adjustment directly inspiring the next. Of his intuitive style of composing, Rich offers, "The substance in the music comes before everything else. The technology just gets in the way if you start thinking about it too much." Disciplined words from a man completely absorbed in the unlimited possibilities of a hand-built monolith. Bestiary is the result of Rich's constant manipulation of the MOTM over time. The result is a linear sonic excursion through peculiar rhythms, odd harmonies and earthen melodies. According to Rich, "My own music is very personal. I don't make it with an awareness of a style or genre." Bestiary is the physical manifestation of this concept. The album seems to have made itself, Rich being there only to guide the music out of the primordial soup and into the air. With no clear references, other than Rich's own proven abilities, it's tough to describe the music on Bestiary. Some will come away with a sense that the album deals primarily with the diversity and possibilities of timbre, while others will be consumed by the album's unique sequencer patterns and unconventional rhythm structures, or maybe you'll feel an overwhelming sense of Rich's ability to render biological organisms and processes into the medium of music. No matter, with each listening you will hear something different, depending on your mood; the layers unfolding slowly. All organisms, elements and processes associated with life share an interconnectedness, inseparability and union - the same way the modules, electricity and circuits which comprise Rich's arsenal of synths do. But where is Robert Rich's place? What does he want out of all this? This artist's hope is that you will listen and hear the subtleties in his music, the mysteries, the beauty.